The thyroid gland, one of the largest glands of the endocrine system, produces hormones thyroxine, triiodothyronine and calcitonin. The first two affect metabolism, development and growth, the third responsible for the formation of bone tissue and bone strength. Along with the pituitary, pineal and adrenal glands, the thyroid gland refers to glands of internal secretion. All of these glands secrete into the blood of biologically active substances that regulate the bodies hormones. Thyroid hormones affect the cell mitochondria, by controlling the processes of oxidation and metabolism, so that body affects the growth and development of man. From the thyroid gland is also dependent on puberty and the normal functioning of the reproductive system. For the production of thyroid hormones need iodine. With the lack of this element of the cancer tissue grows, but the secretion of hormones from this is not increased. When excessive production of thyroid hormones in the adult human develops graves ' disease. Oxidation processes in these patients occurs too rapidly, so the disease is manifested enhanced functioning of the heart, increased body temperature. External signs of graves ' disease – emaciation, bulging eyes. Mental capacity is not affected, but patients can distinguish anxiety. Treatment of graves ' disease aims to reduce activity of the thyroid gland. 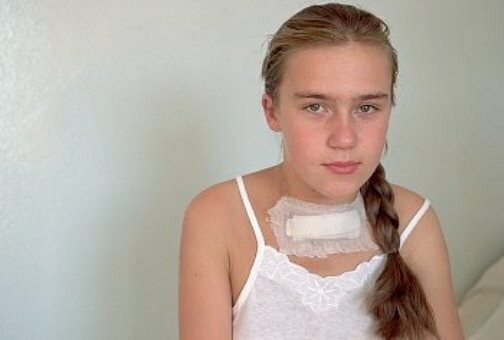 Of drugs used radioactive iodine, incapacitating some of the cells of the thyroid gland, or resort to surgical removal of part of the endocrine organ. After that hormone production decreases and symptoms of the disease recede. Insufficient functioning of thyroid gland leads to myxedema – a mucous edema. Oxidation processes proceed slowly, the heart is weak, which often causes swelling of the feet. Subjectively, the patient with myxedema feels lethargy, weakness and drowsiness. In myxedema the processes of inhibition in the nervous system predominate over the processes of excitation. Especially serious consequences from a lack of thyroid hormones can occur in children. They have disrupted the growth in length and in width they grow normally, which leads to a distortion of the body proportions. This endocrine disease which is called "cretinism", accompanied by a sharp lag of child in physical and mental development. Pathological enlargement of the thyroid gland called a goiter. Its causes are diverse. This can occur due to the mismatch of the number produced hormones the body needs. Increased activity of gipofize and hypothalamus can also trigger the active growth of the thyroid gland. The increase occurs on the background of lack of hormones and in the background of their excess. But the main dysfunction of the thyroid occurs still due to lack of iodine, which is necessary for the formation of hormones. 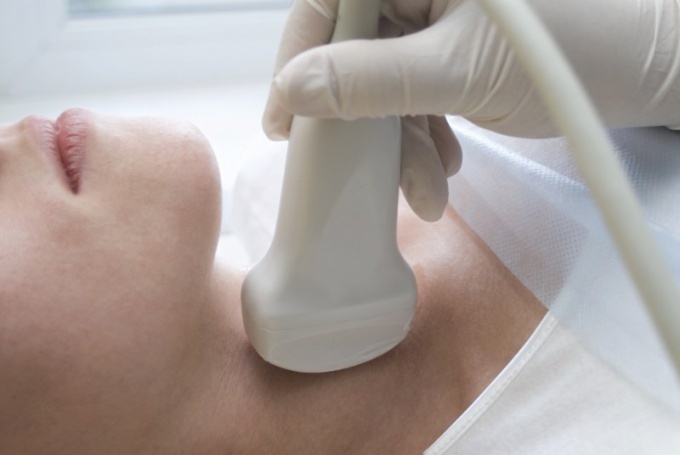 Such signs as fatigue, palpitations and sweating, irritability and hand tremors, unpleasant sensation of strangulation talking about thyroid disorders. Treats this pathology endocrinologist, which if accessed, will appoint the necessary tests for hormone levels. Possible thyroid scan or perform fine-needle biopsy. It is also possible to make a computer and magnetic resonance tomography. Traditional methods of treatment of endemic goiter include receiving iodine-containing drugs, such antistrumin, "Iodine-asset", "Potassium iodide 200 Berlin-Chemie", etc. The drugs chosen by the doctor triggers the functions of the gland, and herbal medicine will enhance and accelerate the positive effect. While reduced function of the thyroid gland prepare the following tool. Mince green walnuts collected before June 24 (Midsummer holiday), mixed with honey in proportion 1:1, place in jar of dark glass with a tight lid. Put for a month in the fridge. Take 1 teaspoon 3 times a day before meals for 40 days. Repeat the treatment after 2 weeks. Guide about juicing, which gives a positive result for a very short period of time, subject to the exclusion from the diet of the patient all meat and fish dishes. Daily drink 0.5 liters of a mixture of juices of potato, carrot and celery. The second option – the juice of potatoes, beets and cucumbers. Only beet juice should stand after cooking for 2 hours in the refrigerator. The remaining juices should be freshly prepared. The course of treatment – at least 3 weeks. Welcome juices can be alternated randomly. Include in the daily diet of seaweed, preferably in the form of a dry powder (pharmaceutical preparation), 1 teaspoon with water, 2-3 times a day before meals. The course is 30 days. In hyperthyroidism good therapeutic effect has a chokeberry. Feijoa fruit have excellent therapeutic effect, necessary to normalize the thyroid gland. Roll grinder 0.5 kg feijoa fruit, mixed with 0.5 kg of sugar, pound until a homogeneous mass. Place in a jar and put in refrigerator for 10 days. Daily take a teaspoon three times a day. In the course of treatment, one cooked portion. A year can hold 3-4 course, with a month break. Without consulting with a specialist, use of iodine-containing drugs is impossible. You can not use tincture of iodine as a remedy, one drop contains iodine as in the entire package antistrumin. From such actions to stop the growth of cancer can only operation. Iodine deficiency in the body – the main cause of hypothyroidism. Remember – in the cold day, your body receives no more than 80 mcg of iodine if you eat at least 100 grams of meat and fish days, for the same amount of fish as meat – 220 mcg.